Call us directly for holiday specials on this software! 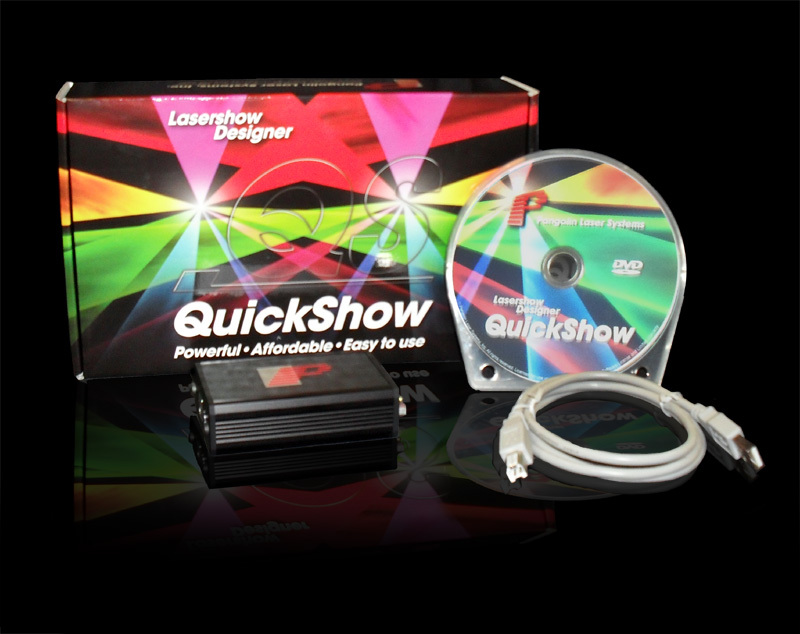 Full tutorial on the software is located here: http://youtu.be/AZzDw0dzSA0 QuickShow is a complete laser system. It is capable of graphics as well as beam effects. It has everything you need for a modern laser light show. QuickShow isn’t just about a better user experience. It also has advanced technology such as the all-new Beyond calculation engine. Beyond automatically takes care of scanner optimization and color mixing. In tests, QuickShow produced noticeably better image quality. One beta tester said: “It made my scanners look new again!” MAIN FEATURES: Cues: Nearly 2000 graphics, animations, beam effects and abstracts are included. Abstract frames: Make planetarium-style abstract shapes, such as flowers or spirograph geometric figures. Live controls: For a cue or the entire display, adjust size, position, rotation angle, rotation speed, color, color cycling, scan speed and animation rate Display timing: Manual (mouse/keyboard), automatic to beat (BPM), autorun for sequences and timeline. BPM methods: Timed, audio beat detect, manual. Preview: On-screen preview of all graphics and beams using Windows OpenGL. Autotrace bitmaps: Import GIF, JPG, BMP files and convert instantly to laser. Outline and centerline tracing modes Custom effects: Apply one or more effects to a cue, a sequence or a timeline event. Effects include colors (preset and changing), pulse/flash/strobe, trace, chop, ripple, mirror, double, scroll, rock, throb, zoom and bounce. Projector correction and zones: Full geometric correction for off-axis scanning. HIt multiple screens from one projector, using projection zones (cues are positioned and scaled to appear in part of the scan area).